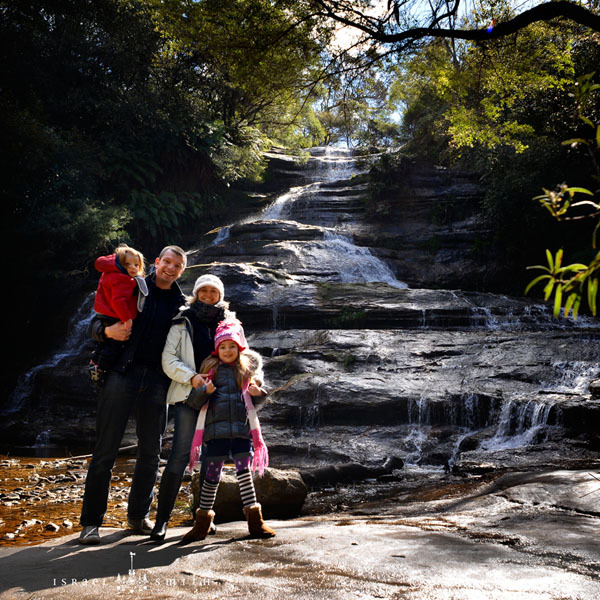 Taking some quality Family Time at the Blue Mountains in August this year. Today is the start of a new facet of the Israel Smith brand and business. I’m sharing my own personal philosophy. Today I’m going to tell you a bit of my story, and give a voice to a serious issue that affects many families in my community. I’ve been internally debating whether to share this so publicly, but after a phone call with one of my clients, I feel it’s time to get the conversation started. The past 18 months have been both the most difficult and most rewarding of my life. After an epic year for my business and my family in 2010, I experienced serious burnout and in February 2011 I was diagnosed with stress-related depression. In short, I was stressed, grumpy and unpleasant to be around most of the time. I understand that we all have bad days, but this was like a bad few months. What’s worse, it wasn’t just affecting me. It was affecting my wife Belinda, my 5 year-old daughter Indrani, and my newborn son Rilien as well. Since then, I’ve journeyed through depression and out the other side. I’ve developed an entirely new philosophy regarding family, life and balance, and I feel great and love my life. With the help of my beautiful wife, I’ve basically re-designed my business to suit how I want to live. Before I get too far down the path, let me backpedal slightly and paint the full picture of my epic year and how I burned out. In 2010, I trained 4 freelance photographers to shoot weddings & portraits for me; shot for and published two books filled with my photography; helped my wife step out of our business entirely; welcomed our second child; trained a new studio assistant to replace my wife; ran and grew our business to record levels; trained for, and completed a full 42.2km marathon; took on more business responsibility than ever before.. and so on. All of this was on top of regular “business as usual” work shooting portraits and weddings and meeting new clients. It was busy. Crazy busy. By Christmas holidays 2011, I felt like I was running purely on adrenaline and hanging on by my fingernails, and when I finally slowed down enough to relax, I simply couldn’t get started again. Returning home from our holiday in January 2011, I resented my business. I was sick of it. I didn’t want to be constantly running the hamster-wheel I’d built for myself. I had no motivation and wanted to sack everyone and let it all go. Worse, I was disconnecting from my family. I wanted my wife to feel free to enjoy our son’s first 18-months without any work-related stress, so I kept my challenges to myself. My kids knew something wasn’t right, and Rilien stopped sleeping and Indrani started misbehaving. The turning point came when my wife started reading about depression on the Beyond Blue website. The site has a quick questionnaire which helped me figure out that I was probably suffering depression. Reading it, I felt like the author had been inside my own head and taken notes. So I called my GP, and subsequently was referred to a psychologist. Over the next few months, my wife and I did a lot of soul searching. We talked, we argued, we cried, and we even went to see a counsellor. At some point we both concluded that our biggest priorities were our health, our relationship and our kids. It was from this discovery / re-discovery that we were able to put a plan in place. I needed to recover. (Obviously.) I learned that my triggers are either too many responsibilities, or not enough sleep. Or both. So I started taking better care of myself, and we started to slow the business down, and set our targets lower. I started practicing gratitude and appreciating everything I already had in my life. Did we really need to push so hard? Or instead, could we take a different approach and spend more time on the important things in life? How much money did we really need to live? How much did our business cost us to keep open? What is the BARE MINIMUM work we can do to earn ENOUGH to live? With that fresh approach, one day Belinda and I went to the local library with a couple of coffees and a spreadsheet of our business and personal budget and expenses. We tweaked the numbers until our brains hurt, and figured out the right balance of work, play and income to help me recover and give us more quality time as a family. Then, we simply set about redesigning our business to achieve that. Now, a little over a year later, I’m fully recovered, and our business is steady. I am the only photographer, and Belinda and her sister Dorothy work with me to take care of everything: shooting, marketing, producing, client loving, admin, finances; it all gets done. Dorothy works school hours Tuesday to Thursday to suit her life and her kids, Belinda works Monday & Tuesday and a little bit of after hours, and I work Tuesday to Saturday. Belinda and I couldn’t be happier, and we’re setting out on our next big adventure – creating a portable business model so that by 2016 we’ll be able to take 12 months and travel around Australia with our kids. There are a few morals to this story that I’d like to leave you with. ONE – Depression and anxiety are real, and have a definite impact on the sufferer, their family and their loved ones. If you or someone you know is having a rough time, check out Beyond Blue and learn more about these illnesses and how they can be treated. TWO – Gratitude is an essential part of a happy life. Taking the time to stop and appreciate just how beautiful our life is already is one of the most liberating practices you can start. We need nothing more than food, clothing and somewhere to sleep. Anything else is a bonus. THREE – Work is meant to be about supporting our life – not overtaking it. If you’re working more than you want to, or more than you should, STOP IT. Your family miss you. Your life is too important to waste it all working. You’re missing all the good stuff. FOUR – We are the masters of our own destiny. Twice now I have redesigned my work situation to give me a better life. The first was when I quit IT in 2004 to start my photography business, and the second time was last year. DON’T WAIT. If you’re unhappy, make a change. FIVE – Remember what is MOST IMPORTANT in your life. Seriously. Think about this and write it down – everything else in your life will flow from this, once you have it clear in your mind. This is intended to be the start of a long and fruitful conversation. As such, I’d LOVE to hear from you. If you have anything you’d like to add, or if you’d like to share your own story, please leave a comment below. IMPORTANT BIT: If you seriously need a chat, or feel like you’re having a rough time, please contact the good folks at Beyond Blue (1300 22 46 36) or Lifeline (13 11 14). They’re professionally trained to help people. They helped me.